This salvia is not from India as its name would imply, but Palestine to Turkey, indicating a love of dryness so don’t expect it to grow well in humid coastal areas. It can be short lived because of moisture, often only one year for me then sets large seed which is easy to grow. It is rather a hairy plant as salvias so often are, with base foliage and spikes of purplish flowers. The bottom lip gets a brown edge to it after fertilisation I think. 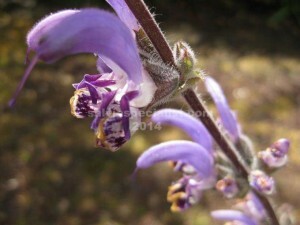 Indica is one of the earliest spring blooming salvias. About 60cm high, clumping, for dry sun. May have this plant early in spring before watering rots it.